Order your Caran d'Ache Ecridor Bille Infini Ballpoint Pen today from FahrneysPens.com. Fine Pens, Refills & Luxurious Gifts – great prices & fast shipping. The Caran d'Ache Ecridor Ballpoint pen is entirely produced in Caran d'Ache's Geneva workshops, and has a hexagonal silver-plated, rhodium-coated body. Its modern design is decorated on all six facets with a diamond-engraved guilloche of the infinity is outlined with exceptional precision using a milling cutter. In a superb blend of ingenuity and technical mastery, the cubes overlap and cascade to create a hypnotic, rhythmic pattern. 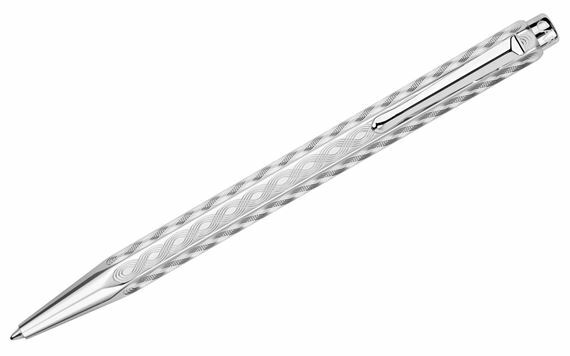 The delicate engraving is the product of meticulous craftsmanship that carries the unmistakable mark of traditional Swiss expertise in the best ballpoint pen. The pen is fitted with high-precision elements that guarantee an exceptional level of writing comfort: a curved retro clip, push-button mechanism for the retractable ballpoint pen and a rhodium finish to preserve its shine and sparkle. A great value for these extraordinary writing instruments with a lifetime guarantee!